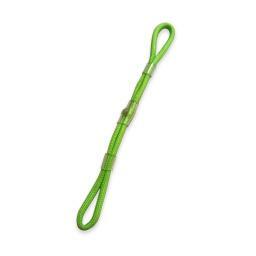 For both amature and pro archers a Bow Finger Sling is an important item of kit. Bow Finger slings are often worn between the index finger and the thumb of the bow hand. It is used to keep the bow in control during shot execution by preventing the bow from leaping forward durring arrow release. Here at Bowrap we make fingers slings by hand from top quality materials military spec paracord. We offer two styles, Single Loop & Double Loop. Its really down to archers preference which they find more comforatble to use. The double loop finger sling has in my opinion an advantage over bow and wrist slings in that it gives you the feeling that it does not interfere with the shot this is partly because of its relatively small dimensions. When using a double loop finger sling the bow will seem to move more 'freely' in your hand, however this is more in the mind than a real effect, as the bow will leave the hand in precisely the same manner as any other type of bow sling when shooting with a relaxed or open bow hand.